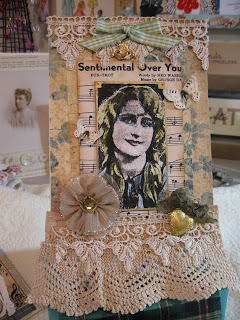 More Artful Gathering pages for You and My New Giveaway Coming Soon!! Hope you All are having a great week so far!!! It has been Hotter than heck down here in Hotlanta!! So I am still busy with ny online art class and thought I would share a few more pages of my heritage book with you!! This is my Aunt Julia who was quite the beauty in her day. Julia was in various beauty pagents and also danced with the Gertrude Hoffman Girls in the 1920's. These two pages are a tribute to my Great Grandfather Peter who came from Scotland. Peter was born in 1850 and was raised on a farm in southwest Scotland and came to America in 1870. He was a maker of fine furntiture and became vice president of the Harlem River Lumber Co. for many years. My online class given by Nancy Maxwell has been so enjoyable. I have learned alot in her class. I will be making the keepsake Box soon that my heritage book will be kept in. Stay tuned to this Blog because I will be announcing my long overdue 200th. post and my Birthday Giveaway.....very very soon! !